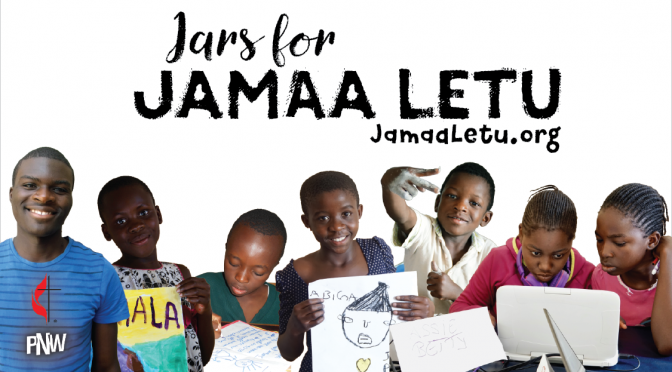 Local United Methodist churches of the Pacific Northwest Conference are invited to support the orphanages of Jamaa Letu in Lubumbashi, Democratic Republic of Congo. Money collected in these jars will be combined into one offering at the Annual Conference in June 2019. Churches: Print the flyer using the links below for your congregations and ask them to collect money at home. Before Annual Conference, collect the personal jars and bring your check to Annual Conference. Individuals: Using the link above print the label for your home and bring your offering to your church before Annual Conference. Church bookkeepers will convert your offering to a check to bring to Annual Conference. This money will support the operating expenses such as food, clothing, school fees, utilities, medical care, and salaries for the staff. Idea: Use a jar to collect coins and bills. Tape to jars and cans for distribution to your congregation. The design of the label can also be used for a bulletin inserts, newsletters, and/or e-messages. Put a large jar in the narthex and encourage people to fill it with change and bills. Send labels home with worshipers to tape to their own jar to be filled and brought back to your local church. Bring the funds to Annual Conference. Please convert the cash into a check prior to making your donation.